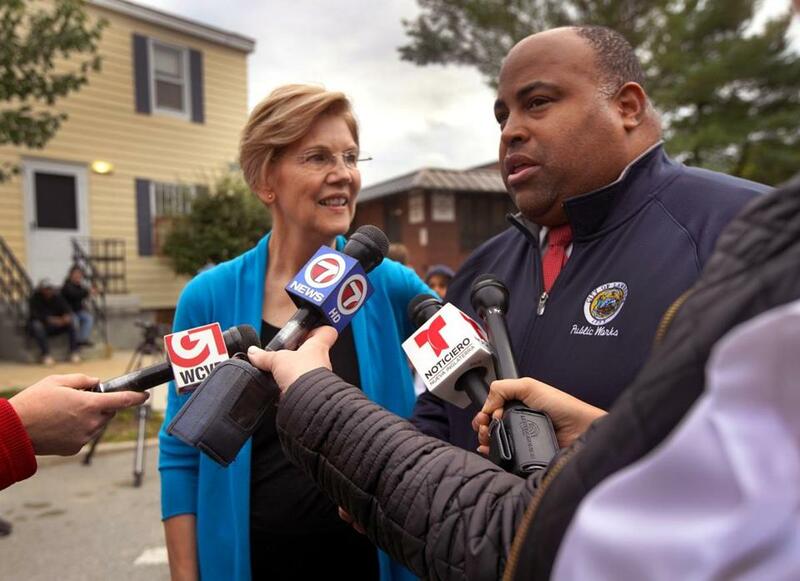 Senator Elizabeth Warren, at a news conference with Lawrence Mayor Daniel Rivera last year, plans to make a “big announcement” in Lawrence Feb. 9. WASHINGTON — Senator Elizabeth Warren is expected to make it official: She will appear in Lawrence, Mass., next weekend for a “major announcement” before embarking on a multistate campaign swing. Warren has not yet said what she plans to reveal next weekend, but she is all-but-certain to announce that she is running for president. In an e-mail to supporters sent Saturday, Warren’s team said she is holding an event at the Everett Mills at 11 a.m. on Feb. 9, bringing a Massachusetts city with a diverse immigrant population and a rich labor history to the fore of her likely presidential campaign. Warren, who lives in Cambridge and was born in Oklahoma, may have chosen Lawrence for its symbolism — and for its proximity to New Hampshire, where she will drive after the event. She will then fly to Iowa. The following week, Warren will make campaign stops in South Carolina, Georgia, Nevada, and California. It is a dizzying schedule that underscores the growing importance for presidential politics of Georgia, where Democrat Stacey Abrams narrowly lost the governor’s race last fall, and California, which vaulted itself closer to the front of the primary schedule in 2020. For Warren, an official campaign announcement will be something of a formality. The senator said she was forming an exploratory committee — which allows someone to raise money but stops short of officially making them a candidate — on Dec. 31, and she crisscrossed the country making campaign-style stops throughout the month of January. But it will offer her the chance to draw a crowd and show off her campaign operation as more candidates jump into the race. Last weekend, Senator Kamala Harris of California announced she plans to run for president in front of a crowd of 20,000 in Oakland, Calif. Senators Cory Booker of New Jersey and Kirsten Gillibrand of New York have also said they plan to run. Jess Bidgood can be reached at Jess.Bidgood@globe.com. Follow her on Twitter @jessbidgood.